Heading down from Salento, by way of Bari, then Brindisi, all the way to the Caves of Castellana, there are so many fabulous, idyllic wedding locations to be admired that will take everyone’s breath away. 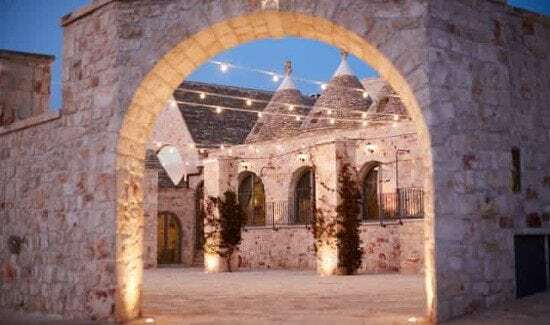 Huge numbers of famous people have chosen Puglia as the region in which to stage their dream wedding. From Justin Timberlake to Jessica Biel, to Indian magnates marrying in perfect Bollywood style, dozens of couples have uncovered a corner of Puglia that offers the perfect setting for their marriage. A growing media focus on the region and the exceptional services available, have led it to become one of the most highly sought-after destinations. Whether you are looking to celebrate a civil or a religious marriage, Puglia is not just about the sea, superb terraces and white sandy beaches – it also provides an enchanting interior landscape thanks to its countryside of majestic olive trees, which provides a frame for the surrounding farms and traditional trulli houses. Add to this the mild weather all year round, and typical gastronomy underscored by age-old traditions – whether huge tables laden with food, immersed in the sights and sounds of nature, or stylish dinners looking out at the moon glittering over the sea – this region turns into an ideal place to organize an original, emotional wedding. Whichever you choose, getting married in Puglia is a party!